For any business to run smoothly and efficiently, there should be a mechanism through which it can handle the tasks like distribution, customer support, email-marketing, CRM and many more. Nowadays Enterprise apps are the most efficient solution to accomplish these tasks. Beside streamlining the business processes, there are a number of purposes that investing in Enterprise Application Development solves – bring the whole team in sync and updated with the progress of a task, enabling real time secure chat platform, giving the employees a platform to save all the consolidated reports, amongst others. Enterprise mobile app is the need of the hour and it provides the best and the easiest solution to the most complex issues that arise in any business. But still, there are a few myths surrounding enterprise apps that prevent the companies from the implementation of the same. Even when enterprise apps have given the corporate world enough reasons to incorporate them into the everyday work process. 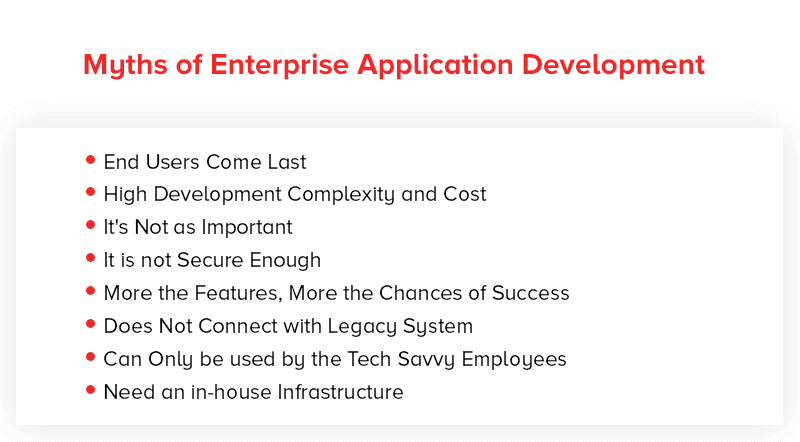 Before we move on to looking at the myths that surround the Enterprise App Development industry, let us first look at the reasons that make them irreplaceable. To summarize, it is the increased work efficiency and better streamlining of work processes that has brought in a high demand for enterprise mobility providers. When you look at the before and after picture of a business that didn’t have an Enterprise App earlier and the success turn that the business took after, you will find a striking difference. Here are some statistics that highlight the changes that businesses have witnessed after getting an Enterprise app with the help of a partnered mobile app development company. Even after seeing the results of an after-enterprise app business scenario, there are businesses that still hesitate to look into this mobile app development guide and get their own Enterprise app developed by the best app partner. And one of the biggest reason behind them shying away from making the investment are the myths that surround the Enterprise Application Development industry or sometimes even worse – Make businesses take wrong decisions, which takes them even farther away from reaping the app’s benefits. Let us now look at what those myths are and what the reality is. The Reality – A business that is aiming to develop an app that solves difficult work process, need to keep the end users in the loop from the day one. Only after discussing with your team what they are looking for in a solution, will you be able to give them what they want? In addition to that, you will have to keep them in the loop to ensure that the functionalities that are getting added in the app or simply the process flow that is there in the app is in line with their comfort level. The Reality – It depends entirely on the business requirement. It is not just about the Enterprise App Development, the factors on which mobile app development cost is estimated is the same across all categories. So, it entirely depends on the complexity of the features that you are planning to add in your enterprise application. The Reality – The corporates that believe having an Enterprise app is not important, fail to understand that CORP, BYOD are some of the mobile revolutions which are not going to stop any passing day. Enterprise Apps are less about user preference and more about a medium to increase the bottom line productivity. The absence of mobility not just hinders the potential to bring the business on a success track but also restricts the competitive advantage count. Reality – Gone are the days when having data on mobile was equal to keeping your data out in the open to be hacked and stolen. In the present time, mobile app development companies incorporate a number of different security measure in the whole app creation process, which ensures that the enterprise mobility solution is hack proof. Modern day enterprise app development agencies are incorporating disruptive technologies like Blockchain in their apps to ensure that the app is impossible to hack or be infringed without anybody knowing. Reality – While it is true that the current mobile app market has become partial towards Super Apps – the one that has multiple functionalities to cater to a whole plethora of user needs, the same DOES NOT apply for Enterprise apps. When it comes Enterprise app development, the success of the app category depends on offering limited features which hit upon very precise employees’ problems. So, when thinking about the features, try and make sure that they are very limited and that you are not making the experience difficult for the users. Reality – The time when mobile apps could not access the backend systems such as Oracle, SAP, MySQL etc without the presence of any API is long gone. Solutions like enterprise level mobile backend as a service(MBaaS), makes it a lot easier for the apps to view and connect with the Legacy systems. The coming of MBaas has even solved API infrastructure concern to a great extent. Reality – The most common belief that businesses will only be able to incorporate enterprise apps in their work process when they have an infrastructural support is NOT true. The apps providing enterprise mobility solutions are usually installed into the employees’ phones, which eliminates the need to install any infrastructural setup. Reality – This is the one myth that keeps most of the established corporates away from taking the advantage of Enterprise Applications. But like all the other myths, this one is equally baseless as the mobile app design standard has evolved to a great extent. What was once focused on 18 – 40 years demographics, has now switched the bases to 5 to 80 years demographics. So these were the Eight Myths that are keeping corporates from Investing in Enterprise App Development. With these busted, it is time to get your enterprise app developed and avail the benefits that come attached to it.